The highly anticipated review (right??) of my stay at the Garden Cottages is finally here. It took awhile because I knew it was going to take a while to write and get in every last nook and cranny of what you need to know. First, please if you can find a way book at least a night or two at the Garden Cottages on your next adults only (or small family trip). Though spacious, they do only sleep 2-4 people and after 2 people in a King bed the other two are on a sleeper sofa to make 4. 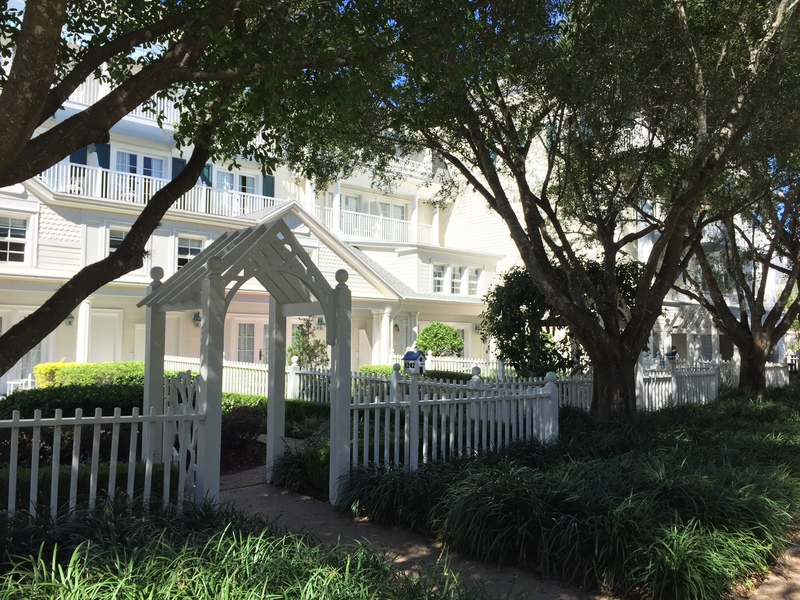 The Garden Cottages at Boardwalk are the most special place to stay on Disney property. I can hands down put it up against the best of any resort and though I have not yet stayed on an over-water bungalow I have stayed at pretty much everywhere else and these cottages are unique and special in so many ways. 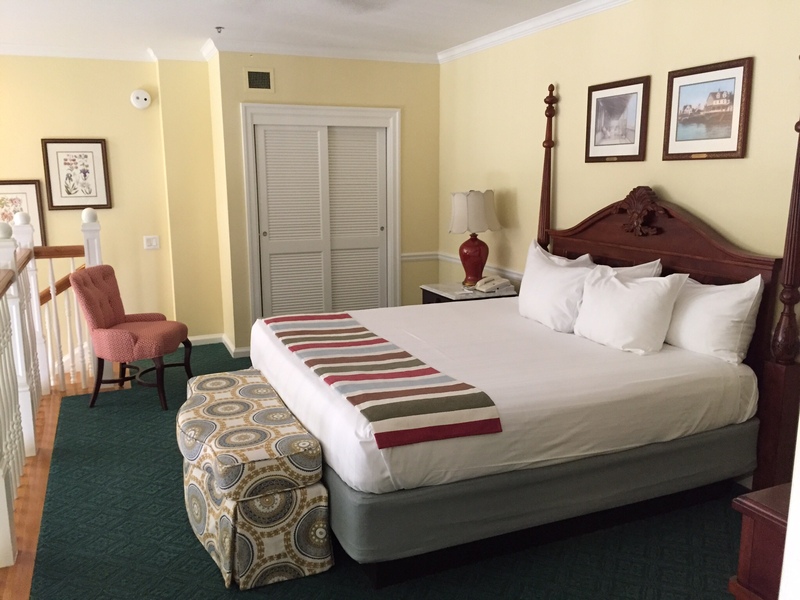 They are part of Boardwalk Inn and are club level so you get all the extra amenities of club level including the lounge access and special check-in so though the price of the cottages might scare you for a minute – they do come with lots of extras. We were lucky enough to get to stay here for two nights at the end of a longer trip that we were staying at Animal Kingdom Lodge. 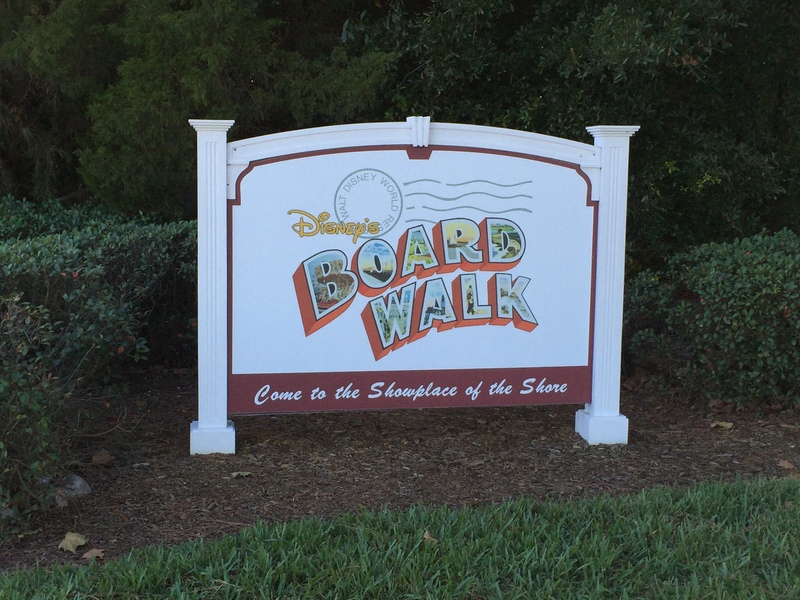 The last two nights just myself and my friend moved ourselves over and when we drove up to the valet entrance of Boardwalk and were whisked away (literally whisked) away to a side door I was so excited to hear “would you like to see the cottages first before check-in”. YES! I did not want to wait one more minute before seeing for myself these hidden gems. We went a secret way out of the building (it may not be secret but it was to me because do not ask me to replicate it) and shot out a side back door to an outdoor atrium area. In this area there were pathways and lush grass and beautiful noises (I promise they pipe in special noises or Snow White was there with the birds chirping). 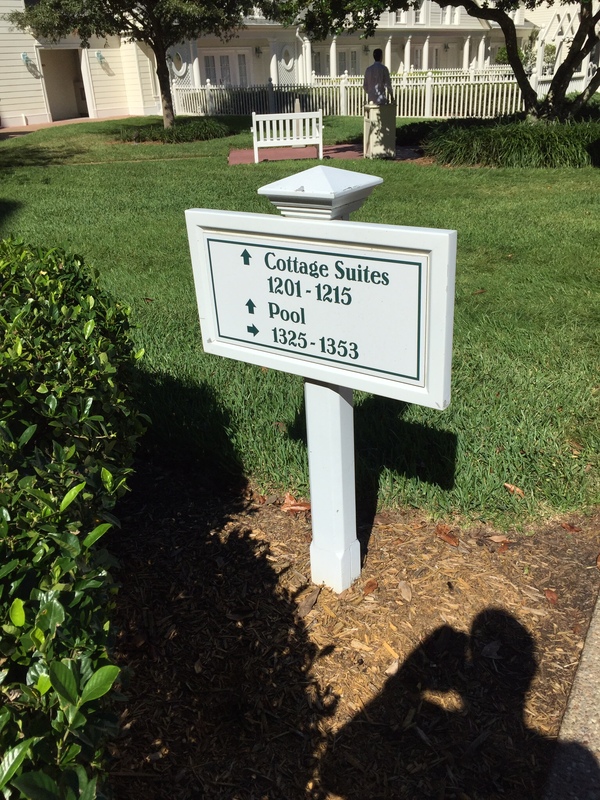 You are surrounded by the Inn and can only see beautiful grounds and resort (and a wonderful quiet pool). You really feel like you have entered into a different world from way back in time when things were quieter and a slower pace. We walked along the path for a minute until our wonderful Cast Member stopped in front of a white picket fence with gate and opened it and said “Welcome Home”. You enter the gate into your own private garden area (and they are all designed a little different) and then your front door are beautiful french doors that open into your 2 story cottage. 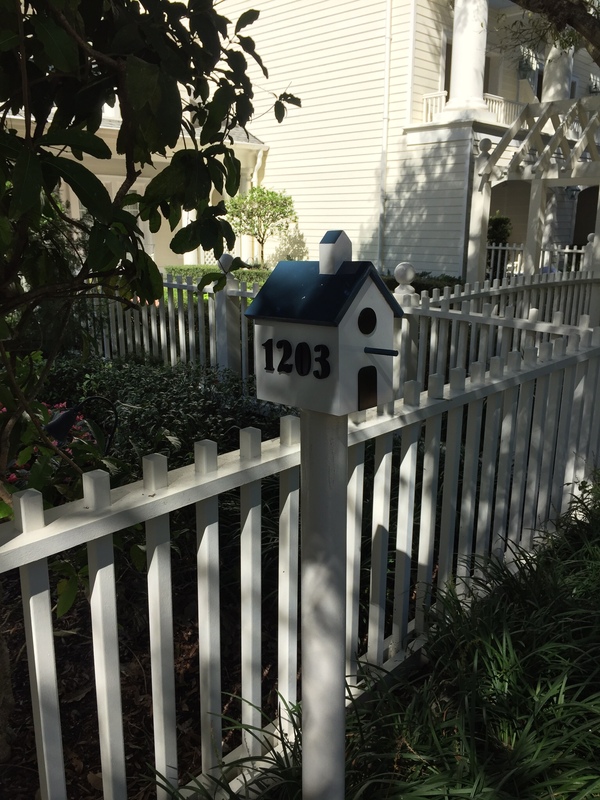 There are 14 cottages total and they line up along the row each with their own fence, gate and cute little mailbox. I could/would and should live there. 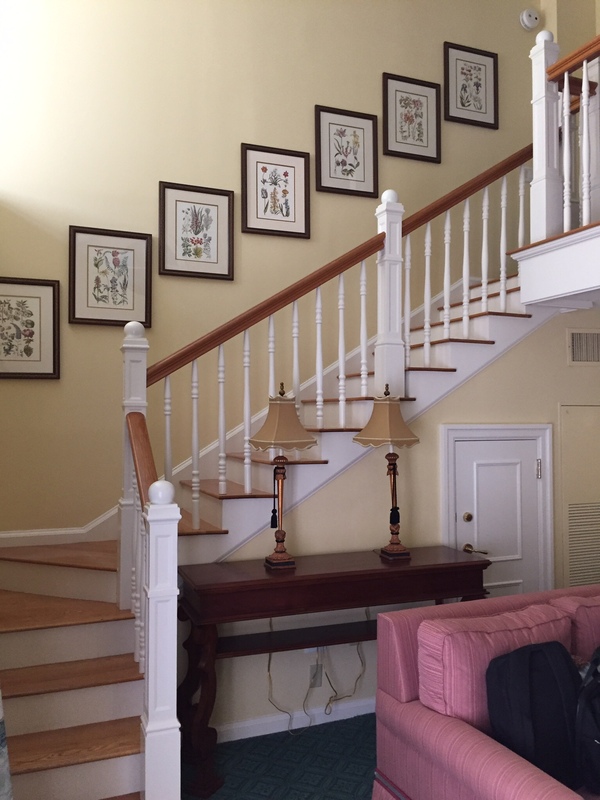 Once we entered and squealed in glee, and tried to act cool for the Cast Member as if we were always in places as nice as the garden cottages, we placed our carry over bags down and went to the club level lounge to check-in and graze a minute. I have reviewed the Club Level Lounge at Boardwalk, so for more info on it please check HERE. Once checked in we went back to explore the cottages. So, let’s start with logistics the cottage is a 2 story loft with the bedroom being a loft overlooking the main living area (so no door to separate you from anyone on the sleeper sofa). When you walk in through the french doors from your private garden (LOVE saying that!) you enter a spacious living area with a full size sofa and a love seat, a large TV, a desk and coffee table. On the side is a half bath and a kitchenette/bar area that is perfect for a cocktail party and inviting a friend or two over to share in your new home (um well for a few nights?!) We did just this and had a couple over to see our new place and have a “house warming” party before going to Food and Wine for the evening at Epcot and they loved our new home so much they have invested in one as well come April! 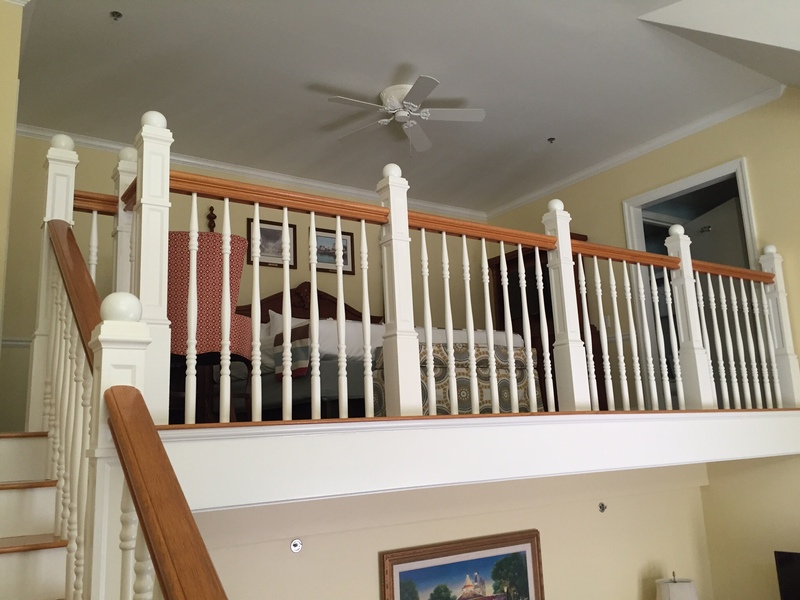 To the side of the living room is stairs going up to the loft with the king bed and dresser and end tables and then a very nice full size bath with the oversize tub and separate shower. One cool thing about the loft is across from it is a large overhang where there are a few large windows that let the sunlight in and out – coolest part is they give you a remote so you can lower these or raise them depending on what you want! Overall the decor goes along with the Boardwalk theme of the 1920’s Atlantic City (or Coastal) decorations and colors. 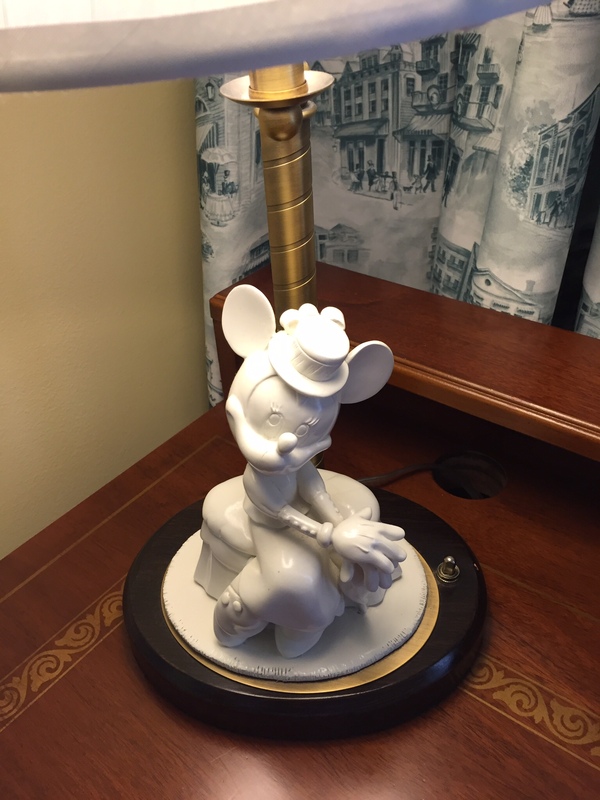 There were so many Disney touches like a beautiful Mickey desk lamp and other Disney treasures in Art on the wall and such that it made the place special. The one piece of info, since this is a review, is the furniture is a bit dated. I think the garden cottages might be ready for a furniture refurbishment. I would not let this stop you though because it is very comfortable and the location and extras far outweigh a bit of dated furniture. We loved these cottages so much it was hard to pull ourselves away from them to go to the parks and honestly had a very relaxing last two days after a fast paced week relaxing in our quiet Disney world. 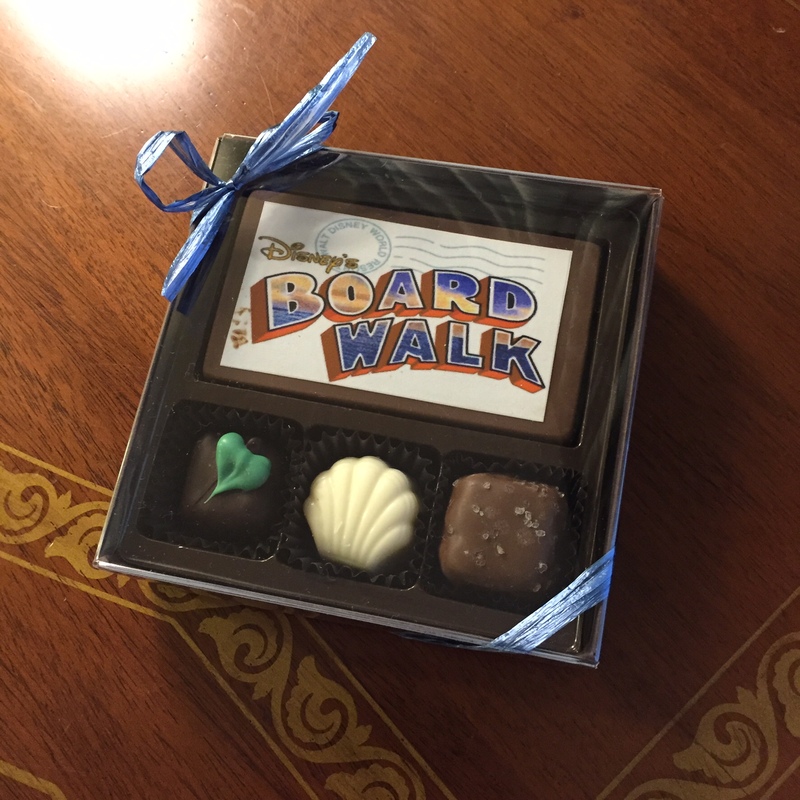 Mousekeeping brought us treats everyday we were there and everyone definitely made us feel loved. I had no idea how special these were and most people have never even heard of them! Have you ever stayed there or heard of them? Let me know! 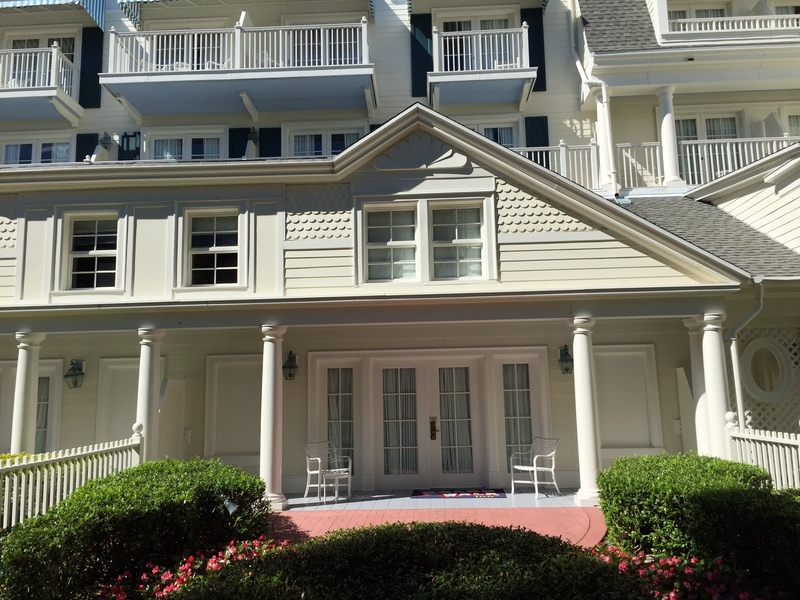 This entry was posted in Disney World, Resorts and tagged Boardwalk Club Level, Boardwalk Inn, Club Level Disney, Garden Cottages, Honeymooners by Tara. Bookmark the permalink.